DON'T WAIT UNTIL THE END OR YOU'LL MISS IT! 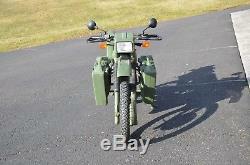 1999 HARLEY DAVIDSON / ARMSTRONG MT-500 MILITARY MOTORCYCLE ONLY 334 MILES! MT500 is one of the rarest and lowest production motorcycles ever made by Harley-Davidson in their York, PA. Sources say only 200+ were ever produced for 1999. One of the first bikes ever made. Less than 350 miles on it. 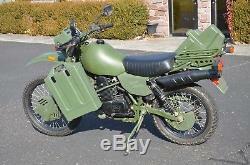 Comes with removable front pannier boxes and a SA-80 machine gun holder case. Comes with a tool kit. Select dealers were allotted 2 bikes to sell, keep, or raffle off for MDA. Bike is in great shape with very low miles. 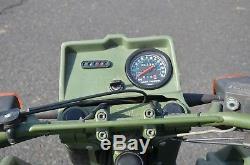 Bike is carbureted with both kick or electric start. About 3500 MT350s and MT500s from 1995 to 1998. MT500s in 2000 were scheduled but may of never been built. 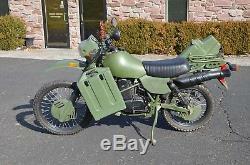 The development of this Harley-Davidson MT500 (M-50 military term) was started by an Italian company called SWM Motor Works. 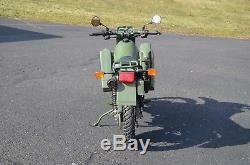 They used an Austrian engine called the Rotax which came in 350cc and 505cc sizes. After winning several trials championships and two world championships, the company liquidated. In 1984 Armstrong of Bolton, England bought the rights to SWM Motor Works. 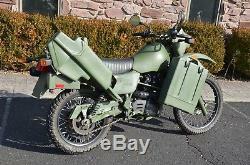 A military version of the motorcycle was developed for use in the Falklands for the British Army, for desert use by the Jordanian Army, and for the Canadian Army to use in mountainous areas. 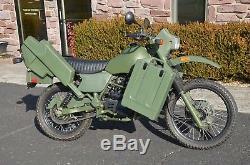 Armstrong made this motorcycle from 1985 to 1989. In 1989 Harley-Davidson bought Armstrong primarily to have the rights to the Rotax engine which was used for their dirt-track racing teams. 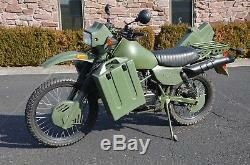 These motorcycles are very rugged and can stand extreme desert temperatures, rocky terrain and harsh environments. They can even stand torrents of fording water as the operation manual states. However, they proved not good for military use because of two problems. 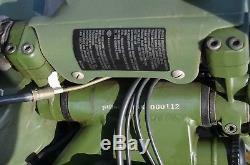 One, the heat from the engine was easily detected by enemy forces using infrared scopes. 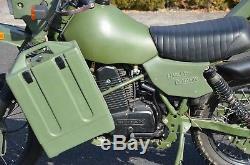 They tried blocking the radiation by adding front Panniers, (Storage case) but to no avail. 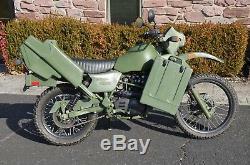 The other problem was the use of gasoline for the bikes instead of diesel which was used primarily by the military. 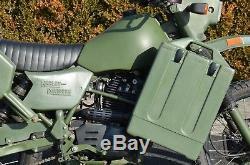 In 1998 Harley-Davidson lost the military contract because they went to what was called a ONE fuel Army. 10% DEPOSIT WITHIN 48 HOURS. The item "1999 Harley-Davidson MT-500" is in sale since Saturday, December 2, 2017. 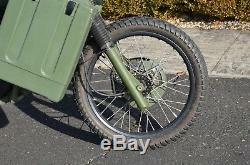 This item is in the category "eBay Motors\Motorcycles\Harley-Davidson\Other". The seller is "americanclassicmotors" and is located in Zieglerville, Pennsylvania.